If you park your car in a town centre or in a shopping mall, you’re going to need a parking ticket. Nowadays they come in 3 forms – pay and display, pay as you leave, and pay online/by text. It’s therefore an ideal place to advertise for 2 reasons: an individual will engage with the ticket in one way or another, and you can make an educated guess on where they’re heading based on the car park they’ve used. Many companies offer this as a service – Ads On Tickets, Adverticket and Ticketmedia to name a few. For example, a car park ticket often ends up remaining in a car for weeks on end or in a person’s wallet as they walk around the shops. Like door drops, they are something that they are forced to touch and read. Also, if they park in a shopping centre it’s likely that they’re going to a shop that’s inside the shopping centre. Whether you’re a Nando’s, a WH Smiths or a Wetherspoons, you’re likely to be able to influence an individual’s purchasing decisions whilst they’re very much in the shopping mindset. Wrigley’s even took parking ticket advertising a step further by placing mint strips on the edge of parking tickets. 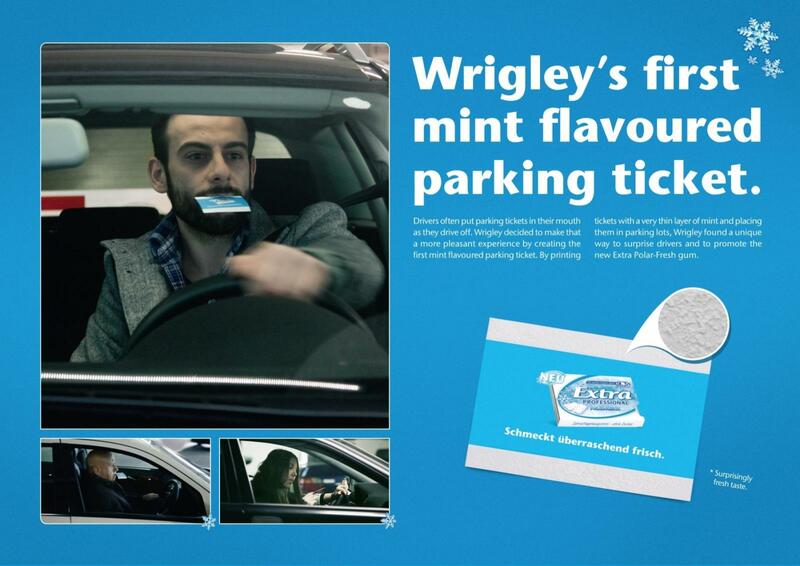 Wrigley’s realised that some parking tickets were placed in a driver’s mouth when they were driving towards a ticket barrier, so they would taste the mint as they drove. Picture this: you’ve just holed a 30-foot chip from the side of the fairway and you walk over to the hole to pick out your golf ball. As you bend down amidst the beautiful surroundings of the golf course, you glimpse a BMW ad in the cup. Would you mind? And would you remember it? It turns out that golfers don’t mind, and the recall for brands that advertise inside golf holes is surprisingly high. Ad in the Hole is the sole proprietor of this technology, and it’s currently live across 23 countries across Europe. Advertisers that have signed up to have their branding inside the holes include BMW, Santander, BMW, KPMG and Dell. When you consider these brands and their relevancy to the typical golfer, you can see why brands would jump on the chance to appear in these spaces and why golfers don’t view the advertising as intrusive. It’s ultimately a very effective way of communicating a brand to a defined target market, and because it’s quirky and novel, the effectiveness of the advertising is amplified. It’s such a simple idea, yet makes perfect sense. Advertisers can even buy space inside holes on the putting greens, if they so wish. I’m sure you’ve seen this one in the news before – video screens above urinals. I passed them off as a gimmick until I looked into the figures, and it turns out that they’re a whole lot more effective than I first thought. Captive Media are the leaders in this space and it produces ‘hands-free’ screens for urinals that double as video games. A man simply walks up to the urinal, unzips, and can play a game by controlling an on-screen object using his… urine. When there isn’t a person at the urinal, the screens carry promotions for the bar they’re in, offers, specials, or forthcoming events. The target audience of “young 18-25 influencers’ is often tricky to reach, but this provides an innovative and irreverent solution to the problem. It’s perhaps this irreverence that makes the technology so successful: it’s silly and looks a bit clunky, but it’s for these reasons that it’s memorable. The average ‘visit time’ of a UK male to a unit is 55 seconds and Captive Media argues that these huge dwell times of individuals that are often out socialising with others means that the content on the screens has a huge recall value. The number of impacts can also be directly measured, which is great for a client with a keen eye on ROI. The big question, however, is when will we start seeing interactive units in women’s toilets?